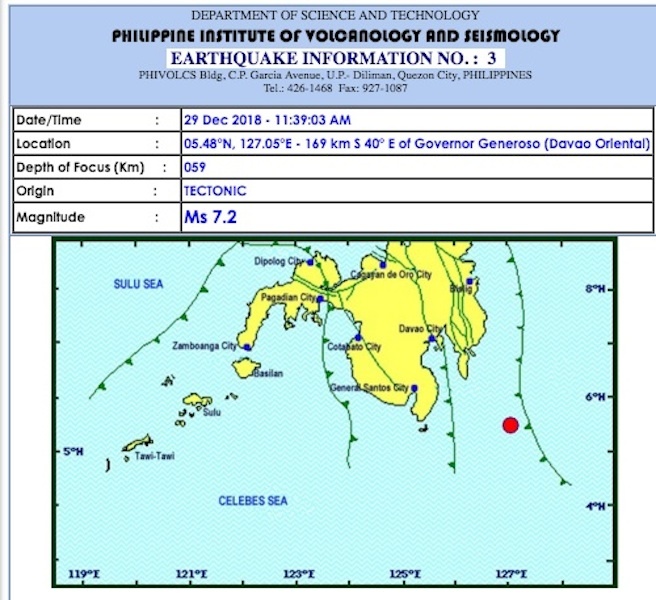 DAVAO CITY (MindaNews / 29 Dec) — A tsunami alert was raised over 10 areas in Mindanao, including this city, after a 7.2 magnitude earthquake rocked the southeastern part at 11:39 a.m. on Saturday but the Philippine Institute Volcanology and Seismology (PHIVOLCS) lifted it at 3 p.m.
“Minor waves associated with this event were recorded by our sea level monitoring station in Mati, Davao Oriental with a maximum height of 0.08 meter,” it said in its Tsunami Advisory issued at 3 p.m. The last recorded wave occurred at 01:10 p.m. and wave heights have returned to the normal tide level. “With this, any effects due to minor sea level disturbances have largely passed and therefore DOST-PHIVOLCS has now cancelled recommendations prescribed in our Tsunami Advisory issued for this event,” it added. An earthquake bulletin released by Phivolcs showed that the location of the earthquake was at 170 kilometers southeast of Governor Generoso in Davao Oriental, with a depth of 54 kms. It said no damage was recorded but aftershocks were to be expected. According to Phivolcs, these areas were expected to experience wave heights of less than one meter above normal tides. It said minor sea level disturbances such as strong current and rapid rise and fall of seawaters were to be expected. The advisory was lifted at 3 p.m. through Tsunami Advisory 3. The Phivolcs recorded 11 aftershocks between 12:28 noon to 3:22 p.m. 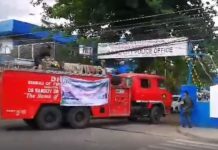 The reported intensities of the 11:39 a.m. magnitude 7.2 quake, according to Phivolcs, was Intensity V in Governor Generoso, Glan in Sarangani and Koronadal City; Intensity IV in Davao City, General Santos City, Tupi in South Cotabato, Alabel, Kiamba and Malungon in Sarangani, Mati City, Manay in Davao Oriental, Rosario in Agusan del Sur, Lebak and Kalamasig in Sultan Kudarat. 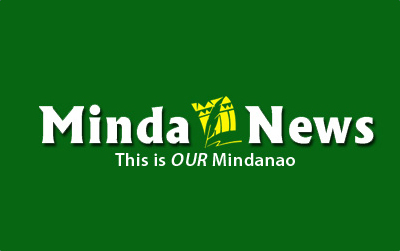 It was felt at Intensity III in Makilala, North Cotabato; Valencia City and Manolo Fortich in Bukidnon; Cagayan De Oro City; Maitum in Sarangani; Tagum City; Mabini, Compostela Valley; Tacurong City; Sta. 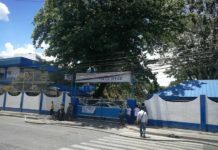 Cruz in Davao del Sur; Don Marcelino in Davao Occidental; Kidapawan City; Banga in South Cotabato; Borobo in Surigao del Sur; Bislig City; Hinatuan in Surigao Del Sur; Butuan City; and in the Visayas’ Tacloban City and Palo in Leyte.